Migori County governor Okoth Obado confessed to an affair with 26-year-old university student Sharon Otieno, whose body was found in a thicket in Homa Bay on Tuesday last week. During his questioning in Kisumu on Tuesday, Mr Obado also told detectives that he planned to buy Ms Otieno a house. He did not explicitly say the baby Ms Sharon was carrying was his, but he did not deny it either. Mr Obado showed detectives a series of chats and text messages between him and his girlfriend as he fought to delink himself from her murder. He laboured to prove that his relationship with Ms Otieno was romantic to the end, and therefore he could not have been involved in her abduction, torture, and murder. Detectives from the Directorate of Criminal Investigations' Homicide Investigations Unit, Serious Crimes Unit, Special Crimes Prevention Unit and the Cybercrime Investigations Unit have been trying to piece together the murder jigsaw puzzle by taking statements from witnesses, the suspects arrested so far, Nation journalist Barrack Oduor, and the Governor and some of his close associates. They have also been analysing text messages and calls from the persons of interest in their quest to find the killers of the university student, who was murdered while seven months pregnant. Ms Otieno was found dead a day after she was kidnapped together with Mr Oduor. Mr Obado, who has been mentioned in connection with the killing on social media and blogs, used the seven-hour questioning in Kisumu and a press conference in Nairobi yesterday to clear his name. First, police sources said, he indicated that he and Sharon engaged in run-of-the-mill love and romantic messaging, both on WhatsApp and SMS. The messages included plans for travel, where to meet, certain items the Governor was to buy, as well as discussions on the future of the baby Ms Otieno was carrying. Detectives also learnt that Mr Obado, 59, had discussed the possibility of getting a house for the woman, even though the chats also indicated that they had not agreed on where to buy or build it. 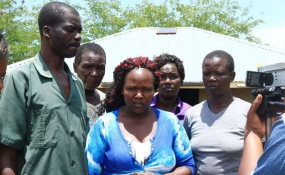 Ms Otieno had at one point indicated that she wanted the house to be in Nairobi, but the governor declined, citing exorbitant prices, and promised to build her one in Migori County instead. It was not clear whether they finally agreed on the Migori alternative, or whether the house was to be built at all. All this, the governor argued, was to show there was no animosity between him and the woman. The Governor, however, was hard pressed to show that there was no animosity between him and Ms Otieno after the girlfriend, frustrated by Mr Obado's stalling on the house plans, copied the chats to his wife Hellen and son Daniel. Detectives now say they will be digging to know if this generated any form of conflict after the Governor's family learnt of the promises he had made to his girlfriend, whom he said he had dated for at least a year. The Directorate of Criminal Investigations has maintained that the investigations into the murder will be thorough, with the head, Mr George Kinoti, expressing optimism that those responsible will soon be arrested. On Wednesday, Mr Obado, for the first time since the death of his girlfriend, showed up for a press conference in Nairobi. He was accompanied by his wife, son Jerry and daughter Evelyn. A few leaders from Migori County also flanked the governor as he made his statement at the Serena Hotel. "As a law-abiding citizen, I want to state here very clearly and categorically that I have nothing, and absolutely nothing, to do with the cruel death of Sharon," he told journalists in the brief conference. He did not take questions afterwards. "I want to urge all our government agencies mandated with investigations to speed up their work so that the killers are brought to book as fast as possible." Later, a statement was posted on his wife's Facebook page saying she had accompanied "my beloved husband" to a press conference and wishing Sharon's soul a good rest "in paradise". The statement was pulled down soon afterwards. Mr Obado, who said he has been devastated, ridiculed and embarrassed by the demise of Ms Otieno, accused some unnamed politicians of linking him to the murder, and the media of giving him "medieval punishment". He sent a condolence message to the family of Ms Otieno and asked politicians and members of the public to stop speculation. He said he had co-operated with the investigating authorities and was ready and willing to do so again. Earlier, police were granted a 14-day custodial order to detain Mr Obado's aide, Mr Michael Oyamo, who was arrested on Wednesday last week, a day after the body of Ms Otieno was discovered.